Make a backpack combining the five-star elements and popular elements in four steps. With a five star, the bag has a strong and distinctive theme. Follow us to learn how to make a backpack with a five star. In our previous views, make a backpack is difficult, that's before we meet felt! A big backpack is convenient when you are travelling, but many backpacks are either not large enough or pretty enough. This one is a combination. 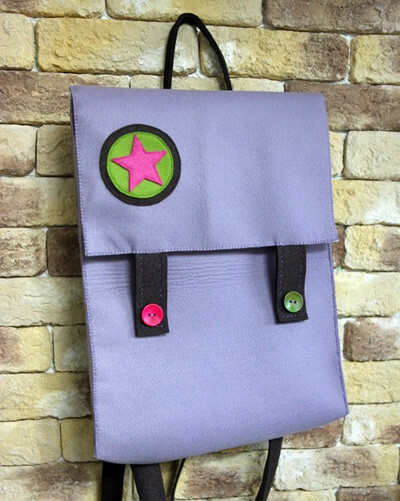 Are you interested in learning how to make a backpack out of felt now? Cut out two large rectangles as right side and wrong side, and a covering cloth for a backpack by tracing templates on the purple felt. Shear two concentric circles of green and black felt, a five star of red felt. 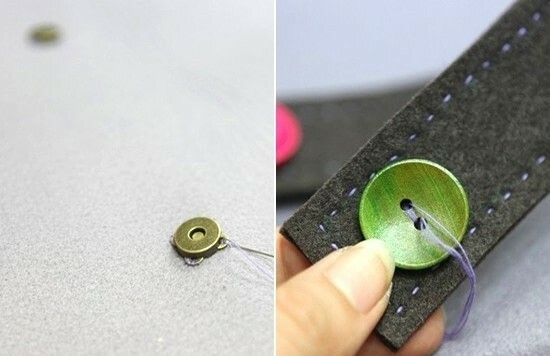 Sew the star with two circles by straight stitch. 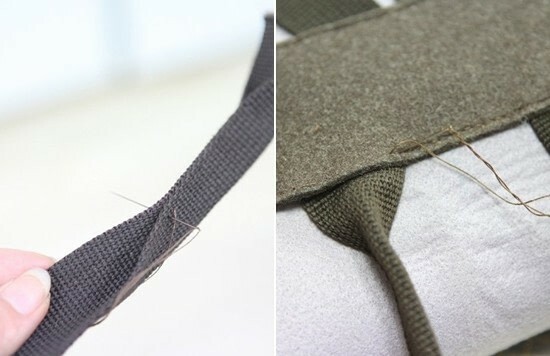 Fold the straps in shape needed and fix them to the wrong side felt; sew them with firm sewing threads to increase the bag's bearing capacity. Shear a piece of rectangle of gray felt and sew it covering the top of the straps to fix them better. Fold the rest of straps in half; sew the edges except both ends. 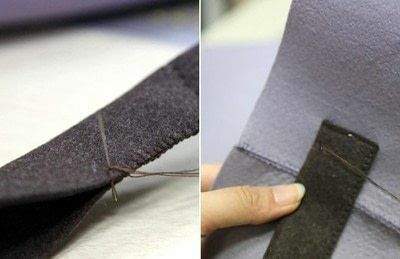 Put both ends into the gray felt and sew them together by straight stitch. 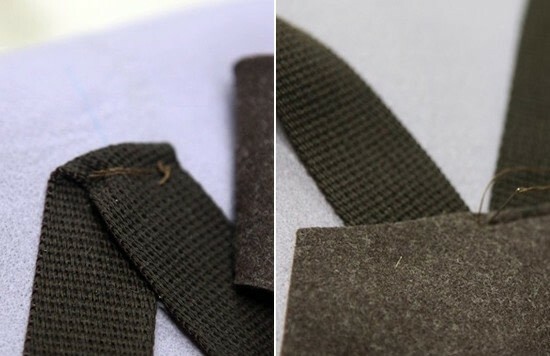 Fold a strip of black felt in half; sew the edges by overcast stitch. Make the other one and sew them at both sides of the covering cloth. Sew two magnet buttons on the right side felt, two resin buttons on the right side of buckle straps and the other half of magnet buttons on the wrong side. Pay attention to align the places of buttons. 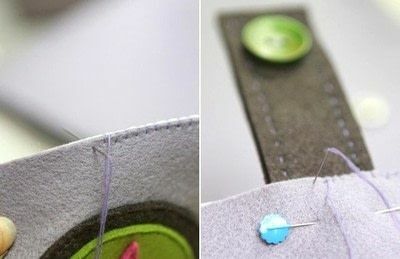 Sew the right and wrong side with three rectangles of felt as the bottom and two sides of the bag. 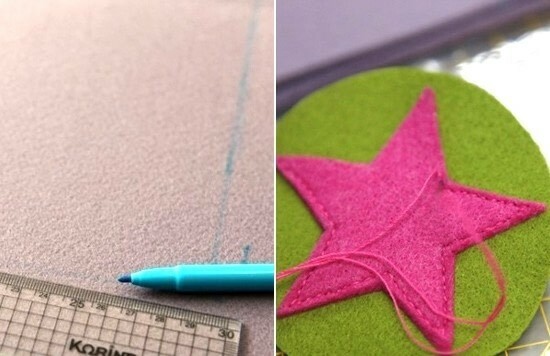 Sew a running stitch at the edges of the covering cloth to make it neater and add the star on it. Finally, sew the covering cloth with the wrong side felt.